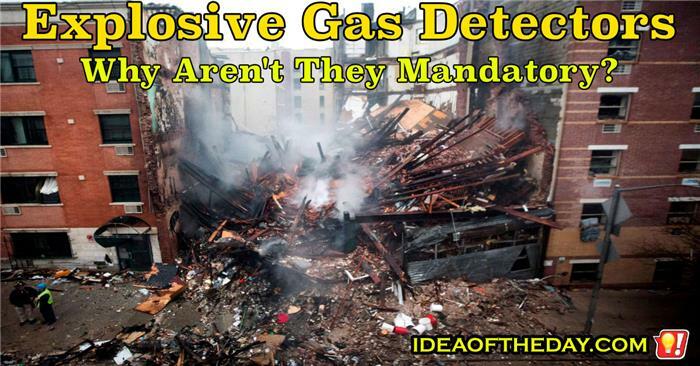 Why Aren't Explosive Gas Detectors Mandatory? A few days ago, an entire building blew up in New York City because of a gas leak. We've all seen news stories from time to time about a house or a building that suddenly blew up. Sometimes they have lots of photos of where the building used to be, but for the most part, there's not much left to see except a small pile of debris. The rest of the debris is usually found scattered over several miles. The strange thing is gas leaks are pretty common, and most of the time people don't pay attention to it. There was recently a gas leak in my neighborhood, and I smelled it as I walked my dog. I didn't say anything. I assumed it was just some other smell or somebody would've done something about it, so I kept walking.